Year: 1958, The Cold War rages on. 1958 March 11, U.S. B-47 bomber accidentally drops an atom bomb on Mars Bluff, South Carolina. Without a nuclear warhead fitted, it nevertheless destroys a house and injures several people. South Carolina immediately offers to surrender, but unsure to whom. After Ayler’s free jazz pushing back the boundaries of sonic exploration, a return to more conventional musical space, in which melody, harmony and rhythm combine with skilful improvisation, exploration within the tune rather than outer space. The tunes I return to are those written by Ray Bryant, who had a knack for memorable distinctive melodies and changes, a perfect platform on which Newborn proceeds to elaborate and extend, putting weight on Bryant’s attractive structures. Phineus Newborn deserved greater recognition but was handicapped by his abundant talent – not suited to the confines of mere accompaniment but not a leader in the league of Bud Powell or Bill Evans. I put him along side the likes of Hampton Hawes: someone special, who swings, and always makes for satisfying listening. Like many talented musicians of the time, his recording career was sadly short. The original Prestige New Jazz cover is full of warmth and personality, though it might have been tactful of the photographer to offer Roy and Phineus a couple of chairs to stand on, gosh, isn’t Chambers tall. 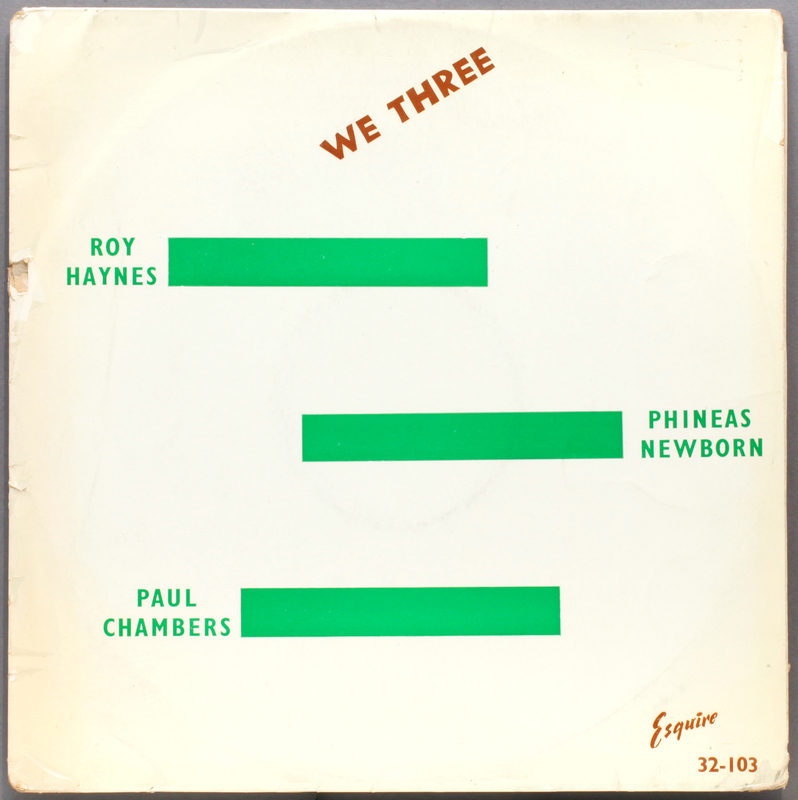 The cover design is an exemplar of the composition “rule of thirds”, quite appropriate to a trio, and the picture answers the unspoken question, who are “We Three”. We are not the Three Green Rectangles according to Esquire. This is who we are. A monster 246 gm heavyweight, heaviest vinyl in the entire collection. One to challenge the VTR setting. Sonically, superb. Scarce stunning rare Jazz set on the sought after ‘Esquire’ Label! A nice Haynes/Newborn record, and as Esquire are good to find, in themselves, rare. I’m smug because I have had a Japanese press for some years and the Esquire wipes the floor with it. 245 gm, one mother**** as Miles would have said. Takes my Esquire collection up another notch, and despite those covers, it’s still a good way to collect “original” New Jazz and US Prestige releases. 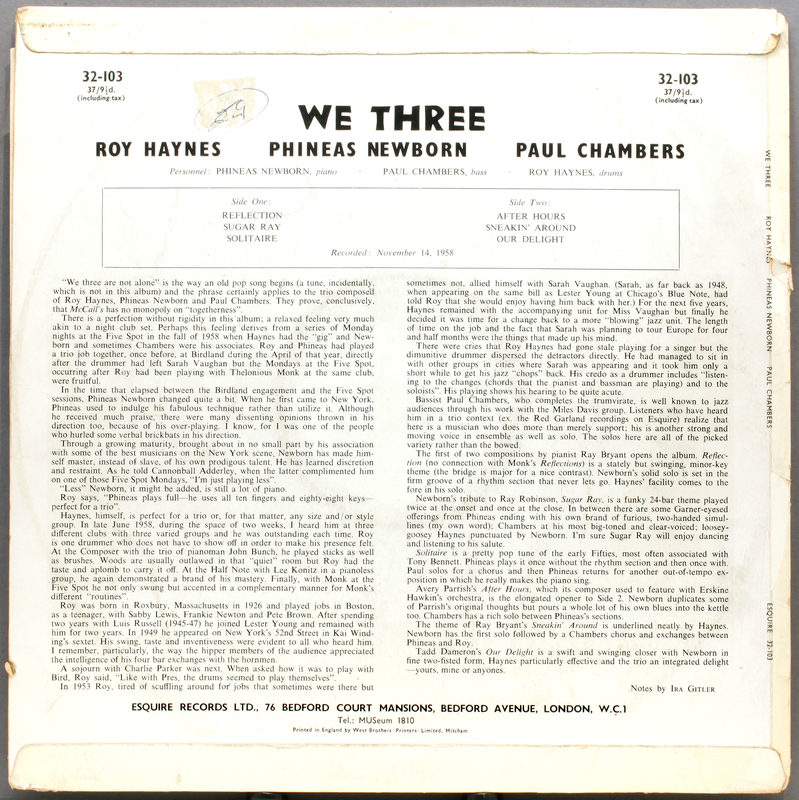 This entry was posted in Esquire, Phineas Newborn Jr, Roy Haynes and tagged Esquire, New Jazz, Paul Chambers, Phineas Newborn, Prestige, Roy Haynes by LondonJazzCollector. Bookmark the permalink. The price of $ 3.98 printed on the back makes this an authentic first pressing, given the other elements you mention. Later on the list price of N.J. albums became $ 4.98. What an interesting nugget of information, Rudolf! An original price guide to first pressings? Any others come to mind? Savoy’s budget label Regent also had a list price of $ 3.98, but this price was not mentioned (printed or sticker) on the sleeve. 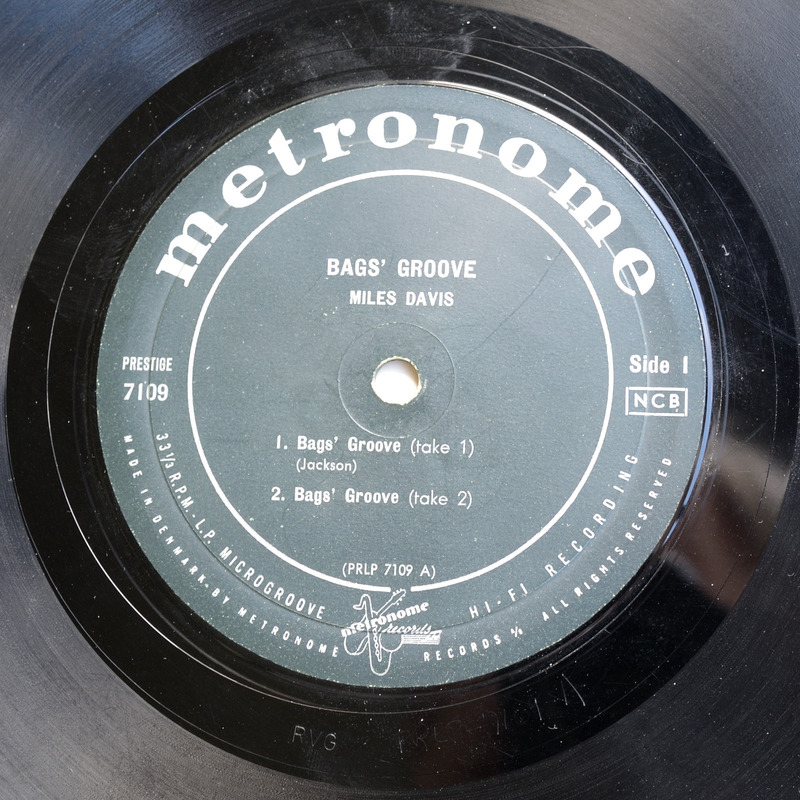 New Jazz discontinued the practice around its 18th issue (N.J. 8218). After 8218 I have not noted the $ 3.98 price sticker. Very often unscrupulous merchants tried to remove the stickers, in order to sell at the regular $ 4.98 price. I have sleeves which are damaged as a result. I think this is the reason why New Jazz stopped the practice of stickering. Lovely session. Just picked up an Esquire, and it sounds phenomenal. I would take a Prestige/New Jazz original for the cover, and Esquires for the sound. There is a wonderfully moving piece about Phineas in Stanley Booth’s book “Rhythm Oil”. Stanley, like Phineas is from Memphis, and the piece describes the state the pianist was in in the mid seventies, and an attempt to get him recording again. As an aside in Memphis his name is pronounce Fine-us. I was chatted with someone from the town who kept saying ‘Fine-Us’ and it took me about ten minutes to work out who he was talking about! I’ll look out for it. Meldhau is the only modern I listen to nowadays, on Evil Silver Disk. . His Trio Live at the Village Vanguard interpretation of Wonderwall has me eating my words for all three courses. Black Sun is sublime also, but in truth Jeff Ballard is the real star for me. If his duo makes it to vinyl I’ll watch for it, though electric piano may be a bridge too far. I tend to choke on electric instruments. The best show of his we’ve seen was at the Old Town School of Folk Music with his trio – right up at the stage, perfect acoustics. Amazing stuff. Also, he kindly singed a poster for my wife at my request. A gentleman. Funny how jazz musicians are so often humble and polite. In contrast to those in the pop field, where the things that matter most are the lyrics, the singers hair cut, and what clothes they wear. is weight in itself a mark of audio quality? I noticed that Esquire started to use this superweight roughly from 32-090 to 32-110. But these presinngs were not better than the less heavy pressings produced ante 32-090, which were quieter (less background noise). On the cover “design” all has been said. The Esmond Edwards 8210 sleeve is a real beauty. You are quite right, Rudolf, there is no audible difference arising as a result of vinyl weight. I believe the depth of cut is set at mastering, and from that moment on it doesn’t matter if its pressed on 250 or 150 gram, or probably even 100 gram. I just rejoice in the sheer weightiness of them, the extravagance of the quantity of the artefact. It not like you can have a “heavy CD”, can you. Its unashamedly analog, flaunting it. Interestingly it bears a stamped EX in the runout, the second I have seen, and it is not Abbey AB manufactured stamper. No idea what or who it means, but I think its a factory stamp not an engineers initials. X is sort of an unusual letter to start a surname. EX: that must be an Esquire marker. My NJ 8210 has the stamped RVG and hand-etched NJ 8210-A resp. NJ 8210-B. Then on side A it has a single B stamped and on side B a single stamped A. AB quand-même? 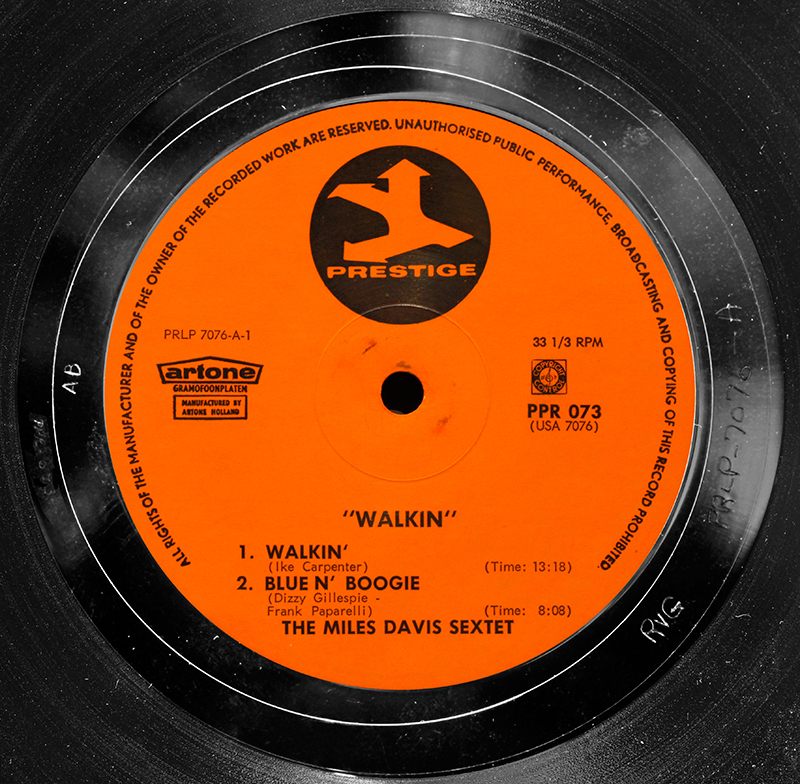 I think I think Prestige (and hence New Jazz) were promicscuous in their choice of pressing plants, unlike Blue Note, and a proportion of the work went through Abbey. 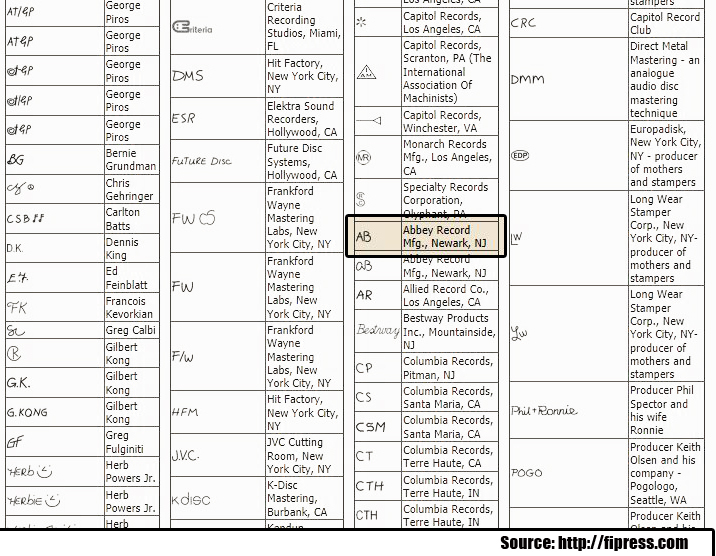 It is coincidental that records have an A and a B side, and that Abbey used AB as their signature. Because it is found on some Prestige as well as Esquire, Artone and Metronome I assume it originates from US metalwork – fand I assume Abbey. 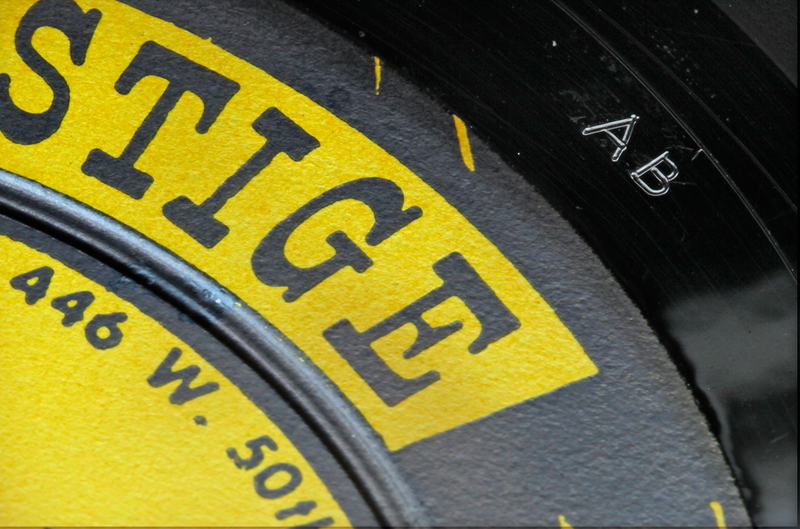 Abbey pressed some records for Prestige and their metalwork went to Decca in UK who pressed the Esquire with them. I got no other explanation, could be completely wrong. The EX may be a third party marking, but I have only seen it on one other Esquire. I am open to all explanations! I know nothing! 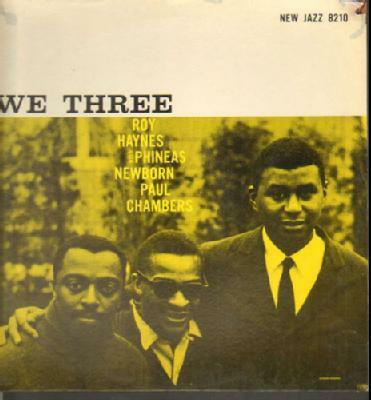 I love piano trios and “We Three” is an absolute marvel. On the evil silver disk, of course, but still. On the AB etchings: I have two Prestiges with the same AB in their trail off groove close to the label and in one case partially pressed into the label: Thelonious Monk Quintets PRLP-7053 (photos HERE) and Django, Modern Jazz Quartet PRLP-7057 (photos HERE) – make sure to watch in slide show mode. Gee Mattyman, what a lovely copy you have got of # PrLp 7053 and 7057. Both are essentials in the Prestige catalogue. i loved the slide show, very well done. You have noticed that at places there is also a lost A somewhere in the dead wax, which not related to side A or B. A first pressing? B exists too. Sometimes there is a thin dividing line between brilliance and inanity – after careful consideration over a period of several seconds I have decided that this cover is deffo in the latter category.